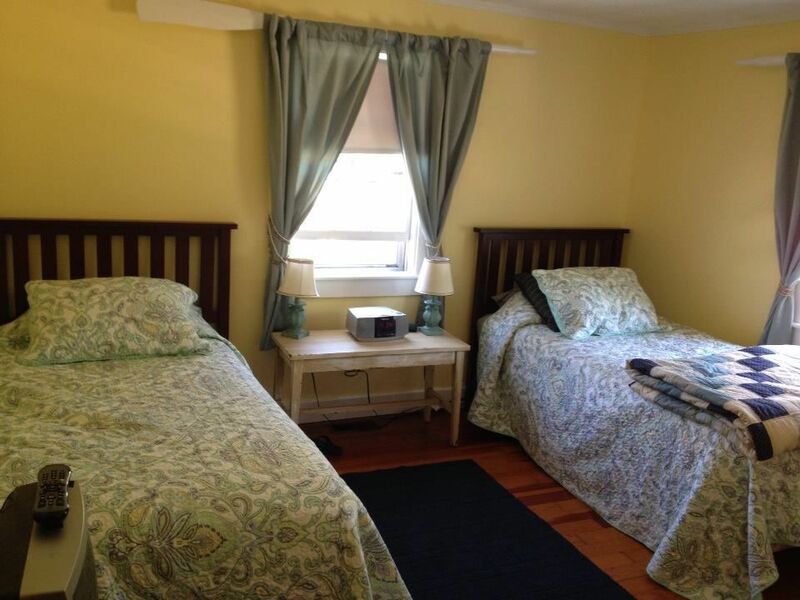 2 spacious bedroom house with a large fenced and private backyard. 1/2 mile easy walk to the beach. Coffee shop, local restaurants, and ice cream, all within an easy walk. Outdoor shower, deck, and driveway. Comfy, cozy and well located. Freshly updated bathroom and kitchen. This is a family friendly neighborhood without heavy traffic. 10 minutes from the Dennis exit 9 near the Stop and Shop plaza. Bike trails and kayaking with an easy drive. Plenty of privacy and elbow room. All varieties of beaches available. National Seashore is a short drive. Fully fenced in yard. This is a non-smoking cottage. No more than 2 dogs. This house is an all season house that has such good bones that reflects a 1950's standard. We did updating with a deck, outdoor shower and all new appliances, as well as a new bathroom and kitchen updates. The yard is regraded and seeded, with a new gated picket fence added this spring. This property is a total joy for me to share with friends, old and new. What makes this home great is the location. It is 10' from the Exit 9 on Rt. 6 at Dennisport, near the major shopping area. It is an easy drive to get there, and then it is off of the main roads. There is no fast traffic to deal with. The neighborhood is quiet, which allows for walks, bike riding and great stars on a clear night! A nice walk in the evening will show a sky bright with stars unhampered by lights. Inman beach is a 0.5 miles walk.There are many beaches on the Sound side, and the Bay side, as well as an easy drive to the National Sea Shore. Yes, but we do not use it. None, You need to wash your own. Fully furnished for plates, real and paper, with wine glasses, and pitcher for lemonade. Bread box, mixer, blender, crock pot, coffee maker both a Mr Coffee and a Kurig. cards, a few games and puzzles. nearby You may need to google it. Was a clean comfortable property in a quiet area, but was close to many activities. Our dog loved the fenced in yard. Would highly recommend this property. This was a great location, we were able to enjoy all the cape has to offer and never encountered traffic. Plenty of places to eat and shop, and the pet friendly, fenced yard was great for peace of mind. Very quiet neighborhood, and a 5 minute walk to the beach! In all my years of going to the Cape and different towns, this was by far one of the best, stress free vacations ever. Hoping to do it again next year! Our dog loved it. the master bed should be retired is my biggest complaint. overall nice place in what seemed to be a quiet neighborhood minus the 2 neighbors on either side doing construction and the wood chipper and chain saws on july 4th morning at 8am! loved the outdoor shower. We had a great weekend at this lovely 2 bedroom home! The backyard is well taken care of with a great deck, amazing outdoor shower, and a fenced in yard for dogs to enjoy! We will definitely come back and highly recommend checking out this spot to others. Quick walk to the beach as well. Great place!!! Thank you Tricia for coming. Please come again. The Garden will be updated this summer to add beauty to the backyard. Beautiful cottage...clean, nicely decorated, dog friendly, met all our needs!! This cottage in Dennisport was close to everything, but it's in a quiet neighborhood, which was nice. The large fenced yard was great for my dog. Late June was a great time to be there, as weather was still a bit cool and the crowds hadn't arrived yet! The cottage felt like home and was very private. Great restaurants are just a few minutes by car. Downtown is close...Inman Beach is within walking distance, although we drove to a National Seashore beach because I had the National Park Pass. I will definitely return to the Cape and this charming cottage!! Many Beaches, Gentle Cape Cod Bayside, and Nanucket Bay, with more tidal action. Bike trails are numerous with adequate parking, Kayaking in any waterway, Restaurants, ice cream, bars, playgrounds all within walking distance. National seashort beach is an easy drive, with shopping every where! There are quiet fresh water ponds for swimming and quiet boating. Middle pond in Brewster is great for kayaking. Take a Ferry to Martha's Vineyard or Nantucket. Bring your bike, too. You can find any activity that you enjoy. The Cape is yours to explore and enjoy! It can be for shopping or environmental enjoyment. Go to the Salt Pond Visitors center if you are new. Many activites are outlined there, along with the geography of the Cape.